As the leading manufacturer of the world’s clearest polarized performance sunglasses, Costa offers superior lens technology, unparalleled fit and durability, and a limited warranty against manufacturer’s defects on all of its products. Still handcrafted today in Florida, Costa creates what has been referred to as the highest quality, best performing sunglasses on the planet for outdoor enthusiasts. Check the Costa website for more info. Family owned and operated, the American Fishing Tackle Company (AFTCO) represents unparalleled quality, performance and reliability when it counts most. Worn across the globe, AFTCO’s fishing clothing is designed to handle the harshest elements. Whether you’re an elite professional bass angler looking to stay dry in a late fall downpour or an offshore weekend warrior seeking protection from the sun’s harmful UV rays, AFTCO keeps you fishing comfortably. Their passion for the outdoors goes beyond their product offering because of an unwavering commitment to help protect fishing resources and angler rights. Through AFTCO’s 10% Pledge to Protect and Conserve, your purchase of any AFTCO product directly supports conservation initiatives. BoatUS has been looking after the interests of recreational boaters since its founding in 1966. BoatUS provides a diverse offering of marine services for the recreational boater, including insuring over 8 billion dollars’ worth of boats, operating the largest on the water towing fleet — TowBoatUS, representing boaters’ interests on Capitol Hill, providing financing for boat-buyers, creating quality boat graphics and lettering, publishing the most widely circulated boating publication — BoatUS Magazine, acting as a mediator through our Consumer Protection Bureau and more. After more than fifteen years of watching and studying lures while operating Nomad Sportfishing Adventures charter operation on the Great Barrier Reef, Damon Olsen and the Nomad Design Team, have crafted a range of unique and innovative lures and tackle encompassing both casting, jigging and trolling designs. They all combine innovative designs with incredible toughness and value and are all made with the specific purpose of doing its job better than anything else available. Big Bay Yachts is a full-service yacht and ship brokerage specializing in powerboats from 26′ to 150′. With over 30 years of experience based out of San Diego, California with international and national contacts, connections from Panama to New York and hundreds of ports in between. Whether it is your first or your 21st boat, a sportfisher, a cruiser or a motoryacht, we can make your boating more enjoyable. With personalized concierge services for management, service, repair, refit, outfitting and new boat construction, no project is too big or too small. Having amassed the world’s largest cartography database, which includes oceans, seas, rivers, and more than 35,000 lakes, Navionics, a Garmin® Ltd. company, makes its unique and valuable content available to boaters on MSD and CF memory cards for use in GPS chartplotters, and within the Boating app for Apple and Android devices. Towboat US San Diego started in 1987 and is the most established towboat company in San Diego, CA. Their experienced staff and eight boat fleet assist thousands of boats per year off the coast of Southern California and Baja, Mexico. TowBoatUS San Diego is available 24 hours a day with the largest fleet of commercial assistance towboats in Southern California and can quickly dispatch a licensed captain to provide you with the service you need. SeaDek non-skid, closed cell PE/EVA products offer safe and comfortable alternatives to molded in non-skid, paint-on textures and other marine traction products currently available. SeaDek is a UV protected non-absorbent foam, featuring an innovative, textured micro-dot surface for enhanced non-slip characteristics. Formulated with a 3M™ acrylic based high-bond pressure sensitive adhesive, SeaDek’s robust, peel-and-stick application makes it easy to install and requires no mounting of hardware. Easy to clean and stain resistant, SeaDek also provides protection for boat surfaces, especially in high traffic areas. In 1997, Accurate Fishing Products introduced its first, revolutionary, TwinDrag® system fishing reels. A little over ten years later, Accurate has expanded its high-tech reel series to include seven blue-water models and eight light-tackle models, all of which have been readily accepted by serious saltwater sport fishermen. Whether you call it offshore, deep sea or big game fishing, our conventional reels and gear will get the job done. Avet Reels have been setting new standards in reel design and performance since their inception nearly a decade ago. They continue set new benchmarks with innovations like the 2-speed lever drag casting reel, an industry first, the patented M.C. Cast adjustable magnetic anti-backlash cast control system, and their new Raptor series reels that produce nearly twice the drag output of the original Avet Reels. Avet’s EX Series Big Game trolling reels continue to be the reel of choice for serious offshore and tournament anglers world-wide because of the reel’s durability, proven performance, and power. Bill Havens at Salty Dawg Custom Rods builds only the finest hand-tailored, custom fishing rods. He caters to the performance, aesthetics, and design specifications of novice, avid recreational, and tournament fishermen who want only the very best in a hand-crafted, custom-fit, and one-of-a-kind custom fishing rods with the utmost attention to detail. Whether you’re looking for the best inshore rod, a rail rod for trophy size tuna using our patented Rail Dawg Grips, or a totally off the wall one-of-a-kind custom fishing rod, Salty Dawg Custom Rods can make it happen for you. Leverage Bill’s rod building expertise and superior rod designs to build the custom fishing rod of your dreams! Batson’s long-standing commitment to integrity, innovation, quality, and passion is the foundation of our vast rod building product lines. Each and every product goes through rigorous engineering and testing before ever being offered to our customers. Batson takes great pride in supplying their customers with the absolute best and refuse to compromise in any aspect of our business. The Batson team delivers impeccable quality, as well as serious competitive advantages, giving you the required tools for your fight for excellence. What good is superior quality if there is no customer service backing it? Batson Enterprises takes this ideal to heart each day. Their experienced team is always ready to lend a helping hand with professional assistance and a positive attitude. CCA California is a statewide, non-profit marine conservation organization working to protect the state’s marine resources and interests of anglers. The purpose of CCA is to advise and educate the public on conservation of marine resources. The objective of CCA is to conserve, promote, and enhance the present and future availability of those coastal resources for the benefit and enjoyment of the general public. By joining CCA you become a part of the more than 120,000-member, 19 state chapter strong organization that has participated in virtually every national fisheries debate since 1984. Hotel Buena Vista Beach Resort is a secluded paradise discovered and rediscovered every day, every year, by both new and returning guests. It’s a wonderful oasis to live in, if only for a few days, or weeks. Maybe that is why it has earned the name of Jewel of the East Cape – a jewel that after 35 years, has become priceless. As Cabo San Lucas was awakening to the buzz of thousands of tourists, Buena Vista kept the old, quiet, authentic Mexican charm. And still does. As time passed, this small fishing resort kept its well-known good fishing and personal touch as well as its loyal guests. And the Valdez Family kept its sense of hospitality. For more than 125 years, Mustad has been known as the world’s largest manufacturer of fish hooks. Mustad is the best- selling hook-brand on the planet and has a presence in more than 160 countries. Mustad products cover any discipline of sport and commercial fishing, industrial as well as traditional fishing. With its own wire and hook production, Mustad can follow the whole process from idea to final product under the same roof. Looking to build upon their early 1977 roots, Phenix began a journey to build a fishing brand that devoted anglers have grown to love. The Phenix team is continually evolving and improving, taking their custom rods to the next level with every new generation of rods. With over 40 years in the fishing industry, the Phenix product lines have expanded to a wide range of rods that utilize premium designs and components. As a result, Phenix customers receive custom quality aesthetics that boost sensitivity and revolutionize performance. Dana Landing Market & Fuel Dock is truly the one-stop shop for the fishing, boating, and water-sport enthusiast. They are located adjacent to the Dana Landing launch ramp in Mission Bay. They offer unparalleled convenience and service to the boating public. Fresh deli food, snacks, and cold drinks will keep coolers stocked. Dana Landing also offers a complete supply of marine accessories and safety equipment! SubSafe is the first of its kind created to protect beloved #pubsubs & so much more! The threading design, complete with a silicone seal, makes it completely watertight. It is the ideal accessory for your cooler or even the break room. Each SubSafe comes with 3 parts that work together to protect both a 6” or 12” sub sandwich. It can also be used as dry storage or even extra cups. Classic SoCal iron lures cast in aluminum and brass. JRI Custom Lures started in 2009 and quickly became a local favorite fishing lure that catches just about every fish that swims. Proud to serve the public and the finest sportfishing fleet in the country by providing the best supply of live bait available, The Everingham Brothers Bait Company has been working hard for fifty years to ensure the fishing fleet has live bait available 24/7/365. The business, which now employs its fourth generation of the Everingham family, is anchored at the same, exact location in San Diego Bay that it was half a century ago. GETSOME 1000 is Long Lasting, Non static, nontoxic, non-staining, nonconductive, it will not dry out, gum up or turn gooey, non halogenic, non-carcinogenic, LOW VOC, NO CFCs, safe on plastics, metals, points, enamels, fiberglass, and no residual petroleum odor. GetSome 1000 is engineered with pharmaceutical grade machine oils and blended with the Newest Technology in High Friction, Anti Wear and Anti Corrosive Additives. This great new product has professional grade, commercial grade, and industrial to household applications. Getsome Product’s Staff has 40+ years of experience and expertise in developing, manufacturing and distributing lubricants and consumer goods. Raymarine is a world leader in high performance marine electronics for the recreational boating and light commercial marine markets. Their products are engineered to deliver the very best in visual navigation information and with a legacy of marine navigation technology spanning over 80 years, Raymarine products are renowned today for their ease-of-use, rugged design, and reliability. Raymarine is constantly innovating to deliver best-in-class sensors and intelligent navigation systems – making your time on the water safer and fun. Sportsman Seafood has been serving the Sports Fisherman in San Diego Since 1965 and now they are offering our exclusive one-stop complete processing services directly to the public! In the very same tradition that founded America’s commercial fishing industry, the World Famous Tuna Jerky Co. located at Sportsmen’s Seafood now offers the same Old World quality and dedicated service that captains and crews have enjoyed exclusively for years. Their family-guarded marinade recipes and smoking techniques are the “SECRET” ingredients you can’t find anywhere but at World Famous Tuna Jerky. When you join FishDope you get more, more phone calls, more fishing reports and more coverage of the Southern California fishing spots. Your small group of fishing buddies instantly transforms into an established network of commercial, professional and recreational fishermen that fish every region of the Southern California and Northern Baja Coasts. competitive edge. For $169 a year – or less than a tank of fuel for most private boats in Southern California – you gain access to the most accurate and up to date Southern California fishing reports available anywhere. Squidco Fishing has been serving San Diego anglers since 1939. They carry a wide array of tackle, rods, reels, fishing accessories and so much more. They are your one-stop-shop for SoCal anglers looking to up their game in the fishing world. 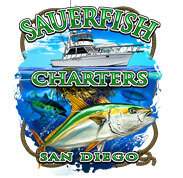 Sauerfish Charters, a San Diego based 6 pack sport fishing charter. They offer all kinds of trips from inshore, offshore, local islands, targeting tuna, yellowtail, white sea bass, bass, halibut, and rockfish. Catalina Offshore Products or COP began as the evolution of owners Dave Rudie’s life as a commercial fisherman in the early days of urchin and seaweed collection off SoCal’s coasts. Opening a small processing facility and supplying local and Japanese seafood lovers was the beginning of the next chapter of COP. Catalina Offshore Products has since grown steadily into one of the region’s premier seafood purveyors and one of the largest seafood buyers in San Diego. Bub’s @ The Beach is a fun and laid-back restaurant that is proud to be located in Pacific Beach. The venue opened up in 1998 and has become known as a Pittsburgh Steelers bar in the middle of San Diego. Bub’s @ The Beach is the spot to head over to, to catch the latest basketball, football and baseball games. There are over 25 HD televisions strategically placed around the eatery. Traeger Grills are the hottest thing in outdoor cooking. No more messy charcoal. No more flare-ups. No more babysitting. No more propane. Not just a grill, a solution to making the best smoked food and more. You can also use Traeger Grills like an outdoor oven, with its even temperature control, you can even bake. Everything tastes better on a Traeger. AB Trailers wants to be your trailer builder, trailer maintenance and trailer repair. A one stop shop for all your trailer needs. Check them out for the quality trailer you need for smooth launches and safe traveling.